Whenever I talk about what kept me from completely giving up on comic books in the 1990’s, I bring up Peter David’s run on the Incredible Hulk and Mark Waid’s run on the Flash. A big part of that Flash era was Mike Wieringo’s artwork. Those were some days where I really needed a good laugh or smile and his work helped to deliver. During a time when everyone was trying to prove how dark, bloody and grim they could be, he flew, ran, swam and drove against that with more skill than he’ll ever get credit for. He and Waid made a team supreme and that was proven by their Fantastic Four work. That run became so beloved that when Marvel decided to end it for a “different vision”, fans layed a verbal smackdown on Marvel to the point where they let the team continue. 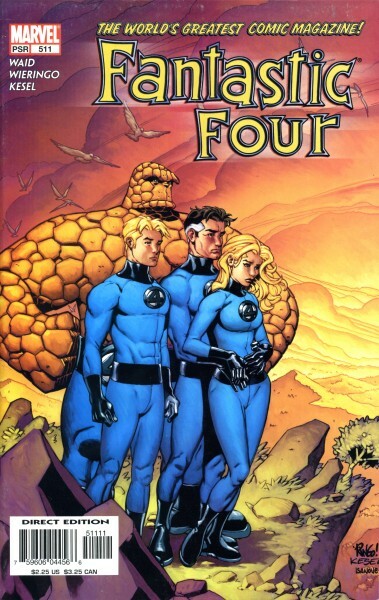 Fantastic Four 511 has what I consider to be one of the most touching scenes in a comic, period. I’m wish I could’ve met him in person and thanked him for being one of the people that kept me from just walking away from comics altogether. Thanks for the artwork, adventure, wonder and smiles.